Zapotitlan De Las Salinas, Puebla. Habitat: Ferocactus recurvus (syn: Ferocactus latispinus subsp. spiralis) is common in the semiarid regions of Central Mexico in grasslands or on rocky hillsides. The range of this species is south of that of the standard Ferocactus latispinus. It is armed with big spines and a waxy cuticle against both vertebrate and insect herbivores. Only the flower is susceptible to predation. 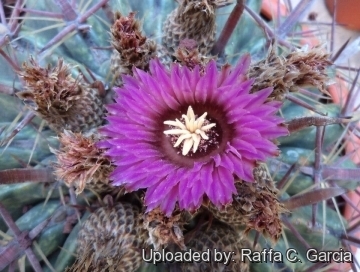 It grows in association with other plant species, including Mammillaria carnea, Coryphantha elephantidens, Coryphantha calipensis, Stenocereus stellatus, Stenocereus beneckei, Stenocereus pruinosus, Stenocereus marginatus, Stenocereus treleasei, Stenocereus dumortieri, Myrtillocactus geometrizans, Pachycereus weberi, Polaskia chichipe, Escontria chiotilla, Opuntia decumbens, Opuntia pumila, Agave lophantha, Agave macroacantha and Tillandsia pueblensis. 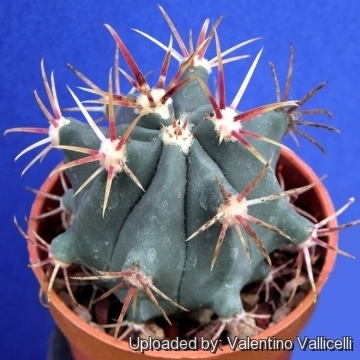 Description: Ferocactus recurvus is a rejected name for Ferocactus latispinus subsp. spiralis, it is a modest-sized, winter blooming barrel cactus that is distinguishable from the standard Ferocactus latispinus for the more elongate to cylindrical stem, fewer and stouter radial spines and only one longer central spine. Stem: Light green to blue-green, larger, upright, spherical to shortly cylindrical, 25 to 45 cm in diameter, 25-50 cm tall, most often taller than wide and exceptionally up to 100 cm tall. Ribs: 13 to 23 ribs (but usually 15-21), sharp and prominent vertical or and twisting as it grows, hence its epithet. Note: Juvenile Ferocactus latispinus subsp. spiralis shows a tuberculate structure, but as it approaches maturity will change to a ribbed formation. Areoles: Large with grey to blackish felt atop bumps along the ribs. Radial spines: 5-7 up to 2,5 cm long, stouter than in the standard species, straight, widely spreading out, annulate white, yellow, pink or reddish. Lacking the more delicate spider-like lateral spines of Ferocactus latispinus. Central spines: One large, broad, flat and recurved at the tip, up to 7 cm long and 4-9 mm broad. This prominent spine is usually red, brownish-red or grey-red, but may be amber-coloured. Flowers: Campanulate, very pale pink with darker purple midveins and a deep almost maroon-pink throat and fragrant up to 2,5-4 cm long and about 3 cm broad. Perianth segments narrow, acute. Scales on the ovary ovate and closely imbricated. Scales on flower tube similar similar to those on the ovary but longer. Blooming time: Late autumn to early winter, usually in October, but it usually flowers only if the weather is warm and sunny ( need a fair amount of bright sunlight to form) This subspecies starts blooming only when reaches a diameter of about 20 cm, while Ferocactus latispinus starts blooming at a smaller size. Fruit: Oblong about 2 or more cm long, 1,2 mm in diameter, clothed in tapering scales. Cultivation and Propagation: Ferocactus latispinus ssp. spiralis (syn. 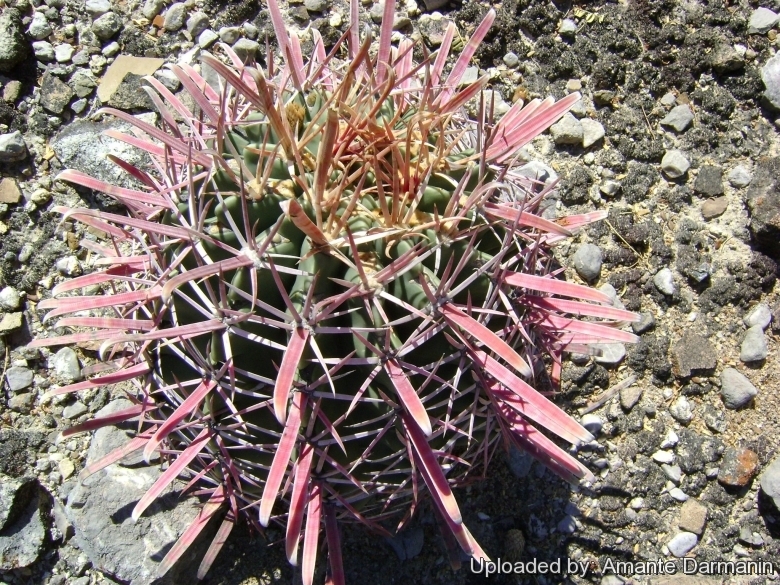 Ferocactus recurvus) is a relatively easy species. Slow growing to start but does well under cultivation. Growth rate: Slow growing to start but does well under cultivation.